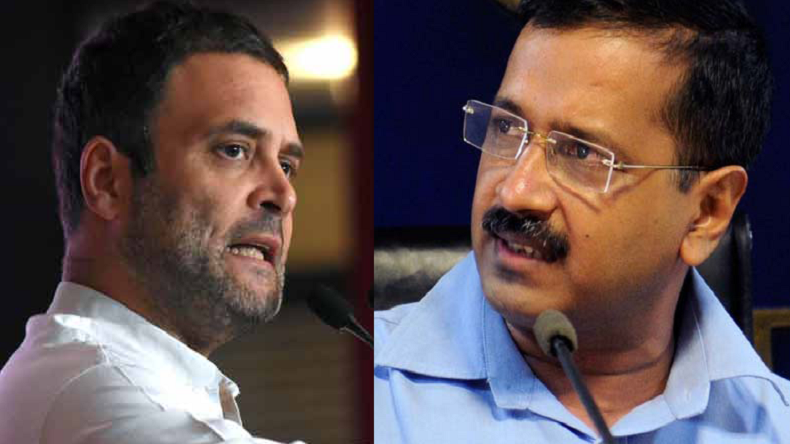 Rahul Gandhi, Arvind Kejriwal in Twitter brawl after Congress-AAP talks blow up: Rahul Gandhi on Monday accused Arvind Kejriwal of doing U-turn over the allaiance between Conmgres and AAP in Delhi for the ongoing Lok Sabha elections. Reacting to Gandhi's statement, AAP convener said that Congress-led gathbandhan is not a concious decision. He accused Congress chief of dividing anti-BJP votes. Rahul Gandhi, Arvind Kejriwal in twitter brawl after Congress-AAP talks blow up: Congress president Rahul Gandhi and Aam Aadmi Party convenor Arvind Kejriwal got into a Twitter brawl on April 15, Monday over who’s responsible for the two parties not contesting in alliance in Delhi’s 7 Lok Sabha seats. The Congress had been keen to tie up with AAP which had ended the grand old party’s 15-year rule in the capital. Reports had said the AAP had wanted an alliance with Congress for Delhi, Punjab and Haryana but the Rahul Gandhi-led party was focused on Delhi alone. The Congress president tweeted that the alliance in the capital would ensure BJP’s defeat from all the 7 seats. Gandhi said that the Congress is willing to contest on three seats and give four seats to AAP. Accusing Kejriwal of making U-turns, Gandhi asserted that the party’s doors are still open but the time is running out. Soon after, the AAP leader and the Delhi Chief Minister wondered which U-turn was Rahul talking of when the Congress and AAP were still in talks. In his tweet, Kejriwal said the tweet from the Congress chief showed that the gathbandhan is just a pretence and is not a conscious decision. He charged the Congress chief of dividing anti-BJP votes in Uttar Pradesh and other states and helping the BJP. He said the country needed to be recused from the PM Narendra Modi-Amit Shah duo. Kejriwal’s tweet echoes most of the social media’s take when the Congress decided to go it alone in Uttar Pradesh and contesting against the Samajwadi Party-Bahujan Samaj Party in Uttar Pradesh. The Congress, however, had come to better understand the dynamics of hitching a ride on the alliance in Bihar and Tamil Nadu where it will play second fiddle to the Rashtriya Janata Dal and the Dravida Munnetra Kazhagam respectively. The party’s inability to manage a deal with either the Mamata Banerjee-led Trinamool Congress or the CPI(M) in West Bengal could hurt it in its bid to scrape together enough seats if it is to play the larger party in a wider coalition. From the past many weeks, both the Congress and AAP have held several meetings over the future course of action in Delhi, but the two parties haven’t been able to avoid the dead end. Last week, Delhi Deputy CM Manish Sisodia said AAP is ready to form the alliance in Delhi Congress but it would be done in Haryana and Chandigarh too. Sisodia said that AAP is ready to shun the differences for the greater good of the country. He added that there is a need to form a joint front against the saffron party. Earlier, the AAP forwarded a proposal on 33 seats in Delhi, Chandigarh, Haryana, Goa and Punjab. But the Congress has not responded to it. He asserted that if they abide by the proposal, the BJP would not win most of these seats. This is a “competition” between two people, as to who is better joker than the other !! But, both of them are MOST suitable to become PM of this glorious country. God forbid, even such a dream! !